Spring is in the air so I just couldn't resist posting a summer photo of Piedmont Park. That's Atlanta's Midtown skyline (part of it) in the background. Oh, sweet anticipation. There's always a lot to do in Piedmont Park. Ongoing through March is The Rink...ice skating at Park Tavern. So if you did not have the opportunity satiate your desire to go ice skating during Snowmagedon of the South recently, you have only a few more weeks to do so. Also at Piedmont Park (watch for announcements of dates) are the 75th Atlanta Dogwood Festival, Screen on the Green, Atlanta Pride, and the Atlanta Arts Festival. And a lot of other fun and festive events throughout the year. 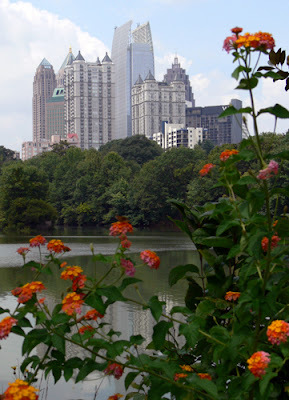 And there's always: walking, jogging, swimming, tennis, bocce, grilling, picnicking, bird watching, and dog walking...to name a few of the other things to do in Piedmont Park. Prepare for spring...it's coming!